At one time alkylbenzene lubricants were considered specialty lubricants and were used only in low temperature applications where oil return with mineral was questionable. * Not true ISO VG range. 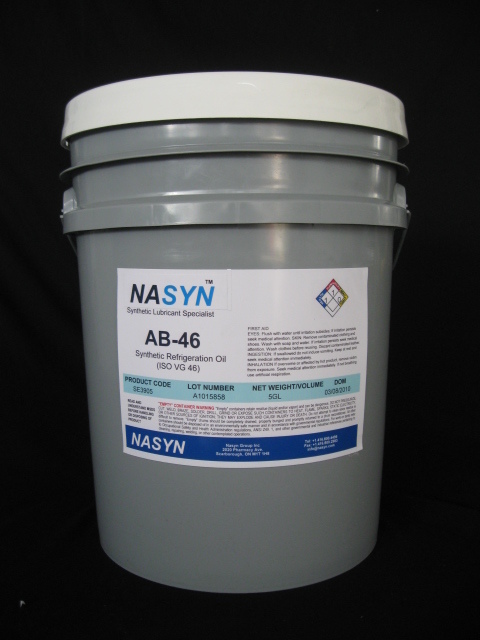 NASYN can custom blend to required specifications. * These values are not intended for use in preparing specifications. NASYN Refrigeration oils are supplied free of contamination and with very low moisture content when the products are packaged. Every precaution should be taken to keep the oil dry and clean to limit the problems associated with dirt or water in refrigeration systems such as wear, plugging, the formation of ice in expansion valves, oil degradation, and copper plating. Keep containers tightly closed, avoid storage in wet locations or outdoor locations, and cover containers if necessary. If you need to apply for product data (including Word documents, PDF documents) please click "Contact Us".